The Apple Watch has its flaws, but one in particular may piss off those who like a little ink on their bodies. 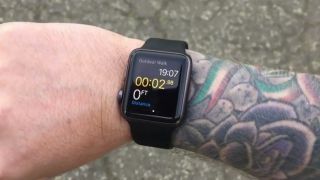 Reports on Reddit and Twitter along with testing conducted by iMore indicate the Apple Watch is running into trouble on some tattooed wrists. The issue looks to stem from the Watch's inability to read users' heart rates and therefore determine whether the Watch is actually being worn (or, as one tweeter put it: "it can't sense you're alive!"). Dark, solid tattoos are where the Watch looks to have the most trouble, according to iMore. The heart rate sensor relies on infrared and flashing green LEDs to pick up users' heartbeats, but apparently artificial pigmentation disrupts the lights' ability to gather accurate readings. The above video shows the Watch working properly on a non-tatted wrist, then lagging and locking up when moved to the wrist with tattoos. iMore got erratic results when it tested the Apple Watch on various tattooed parts of the body, including the wrist, but no issues on tattoo-free spots. The color and design of the tattoos seem to influence whether the Watch works or not, so not everyone with tattooed wrists may have Apple Watch woes. Apple has been upfront that the Apple Watch heart rate sensor may not work properly or at all for everyone, and TechRadar dove more deeply into the sensor previously. Skin with naturally dark pigmentation won't cause the same misreadings, iMore notes; it's only tattoo ink and possibly even scar tissue that's messing with the Apple Watch. We reached out to Apple for a comment, and we'll update this story when we hear back.